Healthier Skin and Beautiful Hair by Using Pi Shower!! Pi Water reactivates the skin cells and strengthens anti-oxidation. Small clusters of Pi Water penetrates the skin much faster, which keeps your skin nice and soft. Pi Processed KDF changes harmful chlorine in tap water into chloride zinc that is good for your skin. Pi Processed Sulfite Calcium (CaSo3) eliminates chlorine and makes water softer. Pi Processed Ceramics converts tap water to energized water, Pi Water. Pi Water reactivates human skin cells and strengths anti-oxidation power to prevent premature aging of your skin. In addition, the small structured clusters of Pi Water penetrates the cell membranes. Your skin and hair stays soft and smooth with beautiful luster. It helps speed up the skin renewal cycle and keeps you looking young and healthy. Q1. Is it bad to take showers in tap water? A: Regular tap water contains chlorine to sterilize water and it kills bacteria in the water. However, the chlorine is bad for our hair and skin. It attaches to the proteins in our skin and hair, which causes dry skin and damaged hair. Q2. I installed a filter for my drinking water. Do I also need a filter for my shower? A: Yes, it is good to have a filter for your shower also. Because although we do not drink the water from the shower head, chlorine in tap water is absorbed into our body through our pores and also we breathe in the chlorine. More over, when chlorine is heated up, it turns into Tri-halo-methane, which causes cancer. Tri-halo-methane volatilizes after 100 degrees Celsius (212 F) for 10 minutes. However, until then, the amount of Tri-halo-methane increases and it is absorbed into our body through our pores and by breathing it in. Q3. Can I solve the problem of chlorine and Tri-halo-methane problems if I install Pi Shower? A. Yes, you can. 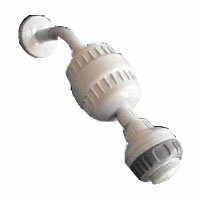 Since Pi Shower eliminates chlorine and Tri-halo-methane in tap water. Please see above for more details. Q4. Does Pi Shower clean the pores of my hair and how much does it clean out? A. Yes, Pi Water is a very small structured cluster, so it penetrates the pores better. This will clean out the dirt and oil, which causes the thinning of hair. The dirt and oil in the pores are cleaned well.